Our fellow Baron Ashler, who has just started a new developing group and has a very nice debut game under due to be released, has dug in his old files to retrieve two pieces of the finest crap, and this is the first one. Be sure to use an emulator in Spectrum +2A/+3 mode and use the Loader option in the menú to load this one – and activate flash loading, otherwise you’ll be sitting waiting for 7 minutes straight – or so. After it has finished loading, the game showcases a nice, but non-bypassable tune using the PLAY command. So add yet another couple of minutes of waiting. When, in the end, you get to the menu screen, you may have forgotten what you were doing in front of your computer, but hey! Redefine your keys and start… playing? The game is a one on one beat’em’up which makes use of the RAM disk to display big graphics. 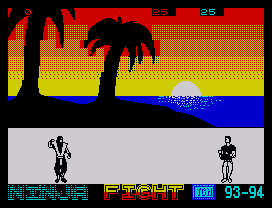 You control an avatar which is reminiscent of Mortal Kombat‘s Scorpion or Sub-Zero (couldn’t tell due to the monochrome graphics) and you objective is to beat the crap out of any opponent who dares to face you. And this proves to be a test of endurance: just to approach your enemy takes ages due to the sluggish animation, and once you have done it you just have to sit pressing kick and it will be done – provided the random AI doesn’t make him do the same, ’cause it seems that his hits are counted first. And that’s all. A good contender for the prize, this time featuring really, really good graphics, but being a complete chore to play. Keys to be redefined are for LEFT, RIGHT, KICK and PUNCH. This is Scorpion, not Sub Zero.